HUGE savings in production cycles! Link to Our Automation Brochure. Yale University Press seasonal catalogs. XML Datasource file imported to plug-in within InDesign. Bliss Design: Creates Graphic Templates with Field tags for each type of page within catalog. Bliss Design: Paginates entire catalog and massages any special pages for catalog. 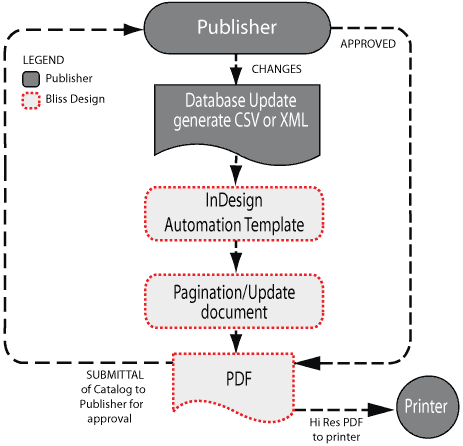 Bliss Design: Creates Commentable PDF to return to Publisher/Editor. This production order is repeated, until Catalog is final. Bliss Design: The Catalog, once approved is produced in High resolution PDF for printer, or low res for website. For some projects we use DocsFlow. DocsFlow lets you place online Google Docs documents as InDesign story contents, just like normal text files. And, much more importantly, DocsFlow maintains a dynamic link so it can intelligently merge Google Docs document changes into the InDesign story contents on each link update, rather than just replacing the story. So you can format, layout, and make minor edits in InDesign, while you and others edit story content together in real time on Google Docs, without losing any work. Catalog Automation using the plug-ins for Indesign can dramatically speed up page creation and ensure your documents remain error free. Your database, which you have already invested time and money developing, can be repurposed to output your print catalogs. By creating a link from your database to your document, you can ensure that your document always contains the latest information from your database. When information changes in the database, the plug-in intelligently applies the changes to the document. This preserves any formatting that may have been applied. Ideal for publications where the source data is likely to change.